Ask fellow campers about "Briggs Woods Park" and nearby attractions. This is a nice City park with a lake,hiking & biking trails. We have stayed here several times. We camped at Briggs Woods Park in a Travel Trailer. Webster City is close with all services. RV repair service & repair close. Wonderful Iowa County Park in large forested area. Campsites are spread out and range from full hookups to electric only to tent and no hook ups. Hiking trails, fishing, boating and even golf! The full hook up sites are a bit confusing- look at the map in self- registration kiosk. Many are designed for large or small groups with RV's and circle or square off in wagon train style! The electric only sites are over a small creek and spaced out a bit more. Weekends are busy with lots of local families camping. We camped at Briggs Woods Park in a Motorhome. Webster City is a fairly large small town with grocery, KMart, resteraunts and easy in-out gas stations. We arrived mid-week for a one night stay. 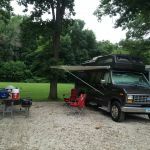 The campground host was friendly and helped us find a spot that we could drive into and out of (it was not really a drive-through but the ground was firm so we did not damage the grass). The sites with full hookups are $25, electric-only are $20. The sites are quite level. They are crushed stone. There is a fire ring and picnic table for each site. Iowa county parks are very nice. This is another one. We camped at Briggs Woods Park in a Motorhome. Canoeing is available just outside the campground. We drove by a nice golf course on the way. We just stayed for an overnight so can't say anything about the lake or golf course. The campground was very nice and not too muddy even after a heavy rain. We camped at Briggs Woods Park in a Motorhome. Another great Iowa county park. Located south of town on an old farm property, there is something there for everyone. First campground with an 18 hole golf course with club rentals. Canoe rentals, river trips, and hiking trails. The campground has an unusual layout. There are several circle group sites with back-ins around the outside. Some shade. Good free air TV and Verizon signal. We camped at Briggs Woods Park in a Travel Trailer. We made a reservation and stayed one night. The reservation cost $5 (in addition to the $20 camping fee), but we were happy to have a spot on a crowded August weekend. We were surprised to have full hookups and Wi-Fi as well. Spaces are oddly arranged, trailers seemed to be every which-way. The park was attractive, but crowded with weekenders. One group got rowdy late at night. It would help to have more policing. Nonetheless, it was a nice park and we would stay again. We camped at Briggs Woods Park in a Travel Trailer. Briggs Woods is a 550 acre county park located approximately three miles south of Webster City on Iowa 17. Located along the Boone River, the complex includes a campground, golf course, lake, woods, etc. Overall, the facility is well maintained. The campground uses self registration. All roads and pads are gravel. Thirty of the eighty-one campsites are full hookup: 50 amps, water, and sewer. Many sites are small, close together, and require leveling. There are sites that accommodate big rigs. Television reception was poor. There was traffic noise from Iowa 17 which runs next to the campground. We camped at Briggs Woods Park in a Fifth Wheel. Nice,clean park. Self check-in system accepting cash only. There are no refunds so you really need to manage your schedule while there. Nice,level gravel pull thru sites but you have to drive across grass strips to access these sites. There was quite a bit of rain in the area which made driving in the grass messy but manageable. Campground Host was helpful & friendly. Would stay here again if in the area. We camped at Briggs Woods Park in a Fifth Wheel. We stayed here mid-week. The park is beautiful. The golf course is convenient and beautiful, as well. Our site was level and the hosts had manicured the spaces well. Very friendly hosts: and I'm not saying this just because they are my sister and brother-in-law. :-) The Park is easily accessible from I-35. We have a 40 foot motorhome and our site was back-in, however, access was easy. This is a very nice greenbelt walking path around the lake and along the river. We would stay here again. We camped at Briggs Woods Park in a Motorhome. Super county park, one of the nicest ever seen. Big shade trees, good-sized sites, choice of FHU or E& W. Very quiet side area by river but just a pit toilet there. Larger front area has shower house and flush toilets but kids (?) had trashed it that evening. Local cop drove thru twice. Mostly families and older campers, not live-ins. Golf course in park too. Highly recommend this place! VZ cell and aircard ok but TV reception depends on site location. We camped at Briggs Woods Park in a Motorhome. What a delightful park! Sites are level gravel surrounded by grass – some are shaded, some are open and roof-top internet satellite dish friendly – most will accommodate any size of rig. We were there in the middle of the week and found it to be a relaxing quiet campground. There is a campground host, but it is self registering at a kiosk after you select your site. We are full-time RVers and just stopped in for the night, but we will definitely return for the maximum stay of 14 days. We camped at Briggs Woods Park in a Motorhome. Nice park right next to golf course some highway noise can canoe the Boone River. We camped at Briggs Woods Park in a Fifth Wheel. Are you affiliated with Briggs Woods Park ?